It doesn't take an astute Star Wars wiz kid to know female Wookies don't shave their legs. The concept of a razor is foreign to the whole Wookie species. Why get rid of gorgeous, luscious, thick, body hair? That's just silly! Wookies wouldn't dare shave their hair because it's both beautiful and functional. Sprinkled with flattering blonde highlights and not a split end in sight, women want to get their hands on Wookie hair and now you can! 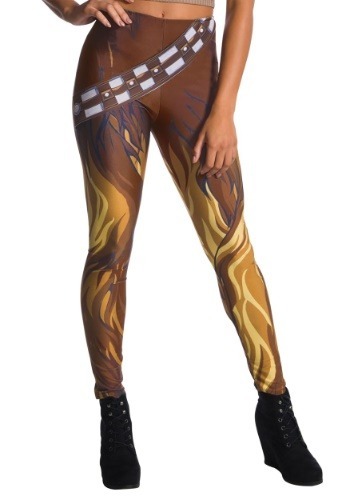 The Star Wars Chewbacca women's leggings offer ladies the ability to present 'naturally' hairy legs to the entire world! Rivaling a 'real' Wookie's enviable locks. The officially licensed leggings casually promote anti-shaving while deliberately showcasing Chewbacca fandom! They're the leggings of your cosplay dreams! Walk this way to clad adorn your legs in lush Wookie fur. The Star Wars Chewbacca Wookie leggings are made from a blend of spandex fibers with printed hair and a bandolier. The comfortable elastic waistband is stretchy and perfect for those who value coziness. Want more Wookie-wear? Well, you're in luck! Accessorize these leggings with a matching costume tank and a pair of furry slippers, then head to a convention!